The Clydesdale Bank, founded in 1838, is based in Glasgow with branches throughout Scotland. Since the bank no longer issues notes to the value of one pound, the commemorative notes have been of a higher value than this. 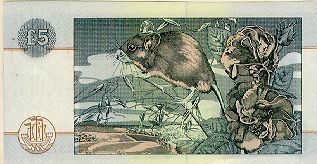 Not really a special commemorative - the Clydesdale Bank's five pound note had illustrated Robert Burns for many years. But in 1996, to mark the 200th anniversary of the poet's death, some notes were produced with an overprint with verses of Burns' poems. The reverse of the note illustrates two of his poems - "To a mouse" and "My luv is like a red, red rose". 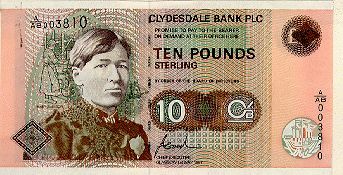 Not strictly a "commemorative" note in that it replaced the previous Clydesdale Bank ten pound note but it was the first time that a woman had appeared on the front of a Scottish bank note. Mary Slessor was born in Aberdeen in 1848. In 1876 she arrived in Nigeria as a missionary in unvisited parts of the country. She adopted many abandoned children, becoming known as "Ma". She died in Calabar in 1915. The front of the note illustrates Mary and (behind her) an illustration of working at a loom in Dundee in the early part of her life. The map is of the area where she worked with the native people. 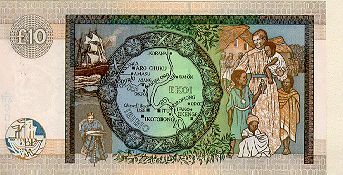 Following in the footsteps of the Royal Bank's note for the EU Summit Conference in 1992, this bank note marks the Commonwealth Heads of Government Meeting in Edinburgh, October 1997. The front of the note is substantially the same as the standard Clydesdale Bank 20 pound note with the head of Robert the Bruce (based on the statue at the Bannockburn Heritage Centre). 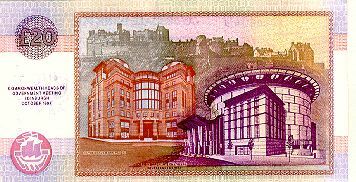 The reverse of the note shows the silhouette of Edinburgh Castle in the background and, to the right, the Edinburgh International Conference Centre where the Commonwealth Heads of Government Meeting was held. The building on the left is a new flagship branch of the bank at "Clydesdale Bank Plaza".